LAS VEGAS, NV – April 10, 2018 – Recognizing groundbreaking installing and monitoring companies, suppliers, and professional security icons, Security Sales & Integration held the SAMMY Awards, Most Valuable Product Awards and the Hall of Fame Inductee ceremony in an evening ceremony at The Venetian Hotel, Las Vegas. 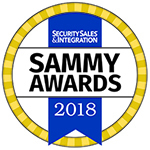 The SAMMY Awards recognize installing security integrators, dealers and monitoring providers for their marketing, installation and overall business excellence. The SAMMYs program raises the bar for the entire electronic security industry by sharing the best ideas and practices with all. Nearly 130 entries were judged independently by a panel of industry experts. Winners of this award receive exposure in SSI’s magazine, website and electronic communications. The Most Valuable Product (MVP) Awards recognize products that make a substantial impact on integrators and were judged on innovation, functionality, competitive advantages, benefits to the installer or monitoring provider, and benefits to the end user. All 54 entries were judged by a panel of experienced integrators and industry consultants. In addition to being recognized at ISC West 2018, winners’ products will be featured in the June issue of SSI, highlighted “callout” in the SecuritySales.com Product Awards section, social media coverage, and an earmarked newsletter article. Bosch Security and Safety Systems, Inc. Founded in 2004 to represent the highest honor for extraordinary professionalism, conduct and achievement, each year SSI’s Hall of Fame pays tribute to those remarkable people who have had an unforgettable impact on the industry, continuously sustained over the duration of a long and illustrious career. Nominated by past inductees and other luminaries, this year’s seven honorees now join nearly 100 others in the industry’s pantheon. Principal, Dennis M. Stern Corp.
ABOUT SECURITY SALES & INTEGRATION (SSI): “The #1 Technology & Business Authority Since 1979” reaches executive, sales & technical professionals who recommend, buy and/or install electronic security equipment, including video surveillance, access control, biometrics, IT networking, intrusion, fire alarm, home controls/automation plus other security products and services. Editorial features include commercial & residential product applications, technology updates, systems design installation techniques, sales & marketing case studies, statistical research and operation management.